Getty/Rick T. WilkingWalmart is beefing up its selection to compete with Amazon. Walmart has set its sights online for growth, beefing up its e-commerce offerings with quick and free shipping to compete with Amazon. It still lags behind in one key area, however, according to analysts at Cowen. The gap in assortment – the actual products offered by Walmart.com and Amazon.com – is still too large, Walmart’s management noted in a meeting with the firm. Currently, Walmart only carries about half of the best-selling products on Amazon. Walmart has been trying to close the gap between the two sites by investing in partnerships to expand its assortment, but it’s been slow going. Walmart knows it needs to have the goods. The country’s largest retailer has set its sights online for growth, beefing up its e-commerce offerings with quick, free shipping and other benefits as it competes with Amazon. But it’s still lagging behind in one area: assortment, meaning the number and quality of the products being sold on Walmart.com, according to analysts at Cowen. 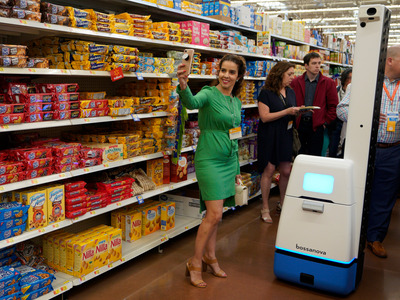 “Adding the top million SKUs is essential, doable, and critical to propelling the [Walmart e-commerce] ecosystem, in our view,” Cowen analysts said in a note to investors. Walmart only carries a little over half – about 55% – of Amazon’s one million best-selling products, Cowen notes. That could mean that Walmart either doesn’t carry many brands or doesn’t have enough depth in some brands for certain categories of products. That’s a problem for Walmart as it tries to lure customers away from Amazon. Amazon’s top one million products account for about 80% of sales on its website, according to Cowen. If Walmart doesn’t have the goods, customers won’t be convinced to shop there, no matter what the shipping offering is or how low the prices are. Walmart is taking steps to try and change that. It relaunched both its flagship Walmart.com website, as well as Jet.com’s website, this year. It has launched partnerships with brands like Lord & Taylor, Advance Auto Parts, Apple, and, most recently, Blue Apron. It has also acquired brands like men’s clothing brand Bonobos, women’s clothing brand Modcloth, lingerie retailer Bare Necessities, and plus-size women’s brand Eloquii. It also created its own mattress and bedding brand, Allswell. Walmart won’t be able to compete with Amazon overnight, however. “These factors are now encouraging more brands to sell on Walmart.com and management noted brands are becoming more interested in Walmart but the process will be a multiyear journey,” Cowen said.